John Foster Dulles was secretary of state while his brother, Allen Dulles, was director of the Central Intelligence Agency. In this book, Stephen Kinzer places their extraordinary lives against the backdrop ofAmerican culture and history. He uses the framework of biography to ask: Why does the United States behave as it does in the world? The Brothers explores hidden forces that shape the national psyche, from religious piety to Western movies - many of which are about a noble gunman who cleans up a lawless town by killing bad guys. This is how the Dulles brothers saw themselves, and how many Americans still see their country's role in the world. Propelled by a quintessentially American set of fears and delusions, the Dulles brothers launched violent campaigns against foreign leaders they saw as threats to the United States. These campaigns helped push countries from Guatemala to the Congo into long spirals of violence, led the United States into the Vietnam War, and laid the foundation for decades of hostility between the United States and countries such as Cuba and Iran. If you could sum up The Brothers in three words, what would they be? What was one of the most memorable moments of The Brothers? 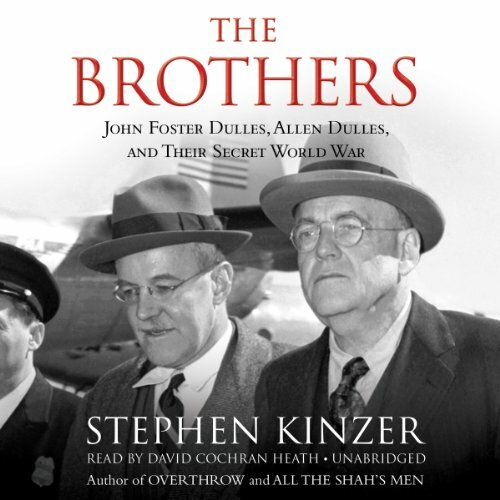 I just finished listening to Stephen Kinzer's extremely well written and researched book about the Dulles Brothers and their place in American history. The book reads like a novel but is full of great research about the 1950's, the cold war and beyond. I was mesmerized by the scope and even- handedness of the author's words. I recommend this book for all who want to have a clearer understanding of a very difficult period in our country's history. This book is a clear and fearless look at our past. The narrator of the book did an excellent job. Llisten to the audio of Stephen Kinzer's book - The Brothers- it's well worth your time. Foster served as a foreign policy adviser to Thomas Dewey, the Governor of New York. Forster became an avid critic of Stalin’s essays and speeches. In 1952 Dwight Eisenhower became President and appointed Foster as Secretary of State. Allen became director of the CIA. Never before had two siblings enjoyed such concentrated power to manage United States foreign policy until the Kennedy brother came to power. Anyone wanting to know why the United States is hated across much of the world need look no farther that this book. “The Brothers” is a riveting chronicle of government sanctioned murder, casual elimination of “inconvenient” regimes, relentless prioritization of American corporate interest and cynical arrogances on the part of two men who were among the most powerful in the world. The author blames the two brothers for most of the evil of the cold war on the other hand he gives little attention to their sister who was their opposite. Eleanor Lansing Dulles graduated from Harvard with a doctorate in economics. She worked for the State Department for over twenty years overseeing the reconstruction of the economy of post war Europe. She helped establish the International Monetary Fund and the International Bank for Reconstruction and Development. When her brother, John Foster Dulles, became Secretary of State he tired to remove her from State but she successful fought him. She was hailed as “The Mother of Berlin” for helping to revitalize Berlin’s economy and culture during the 1950s. She retired in 1962 and became a professor of economics at Georgetown University. If you are interested in history, cold war, covert operation this is the book for you. David Cochran Heath did a good job narrating the book. Transnational capitalism is a phrase I picked up from the book. It is well-researched and the narrator is just fine. What is upsetting to me is that so much of our foreign policy and history over the last half century or more is because 2 terribly self-righteous men who sought to protect their own and their clients' wealth led us into calamitous events of epic proportion. I understand that there was hysteria about communism that now seems unwarranted with 20/20 hindsight. But, they dabbled in the affairs of other countries for sport. We are paying the price now. Clearly, the world we live in today is strategically very different and full of facts not available to the Dulles brothers. Although I am not a fan of the Dulles' body of work, the author vilifies the two in light of the current world situation with but a cursory tip of the hat to the old adage of "Hindsight is 20/20." A great book that tells the story of us, the United States, the effect that the Dulles brothers had and continue to have on our standing in the world, and how we view ourselves. This book explains how our actions during the 50s and early 60s continue to come home to roost. To quote from Gordon Goldstein's review of this book in The Washington Post, "Kinzer, a former foreign correspondent for the New York Times, displays a commanding grasp of the vast documentary record, taking the reader deep inside the first decades of the Cold War. He brings a veteran journalist’s sense of character, moment and detail. And he writes with a cool and frequently elegant style. The most consequential aspect of Kinzer’s work is his devastating critique of John Foster Dulles and Allen Dulles, who are depicted as jointly responsible for acts of extreme geopolitical myopia, grave operational incompetence and misguided adherence to a creed of corporate globalism." I really couldn't say this much better. I would recommend this book to anyone who is interested in the history of the CIA and America's involvement in foreign affairs since WWII. I especially appreciated the last chapter of the book where the author looks at the brother's in light of their upbringing and contemporary world events. This is one of the most well-written and interesting books on modern history I have ever read. Don't pass it up. I enjoyed this book and would recommend it, but it is largely a re-write of Overthrow and it does not present enough rationale for why Eisenhower and the American people supported the Dulles brothers view of the world. The book begs for a counter-balancing account of the Soviet actions in the world in the 1950s. Kinzer blames irrational mass hysteria for creating an American mindset that encouraged the overthrow of many governments during the Eisenhower and Kennedy administration's, but that is too simplistic. There were real reasons for the fear and Kinzer should have acknowledged that. It would have made for a better history. What did you love best about The Brothers? As someone who has learned a great deal about Allen Dulles through the lens of the JFK assassination, I was pleased to learn that a full spec biography of the Dulles brothers had finally been released. To be blunt, their legacy has quite possibly led to the decline and possible end of America as we know it. This book exposes the sordid marriage between capitalism, evangelism and militarism. While those things didn't exactly start under the Dulles brothers, they certainly exacerbated their use in the creation of post war American Foreign policy. The saddest aspect of their legacy can still be seen today in the blind, flag waving, money grubbing, anti progress stalwarts that dominate both the right wing as well as the left. If you want to know who the early CIA was, just imagine the neighborhood bully who picked on you as a child as he grew up, got in trouble with the law and instead of being held to task for his crimes was instead given a job by a covert wing of the government to wreak mayhem in foreign lands, even assassinating leaders to pave the way for Pro western, business friendly dictators, trained by US of course, to take control of their resource rich nation. Most children have played 'Cowboys and Indians' or some variant involving good guys and bad guys, but most children grow out of this naive view of the world and recognize the world for the multi cultural melting pot that it actually is. The Dulles brothers, were not those children. They saw the world in purely black or white, us vs them, Christianity vs all other religions and they made sure to spread that view throughout the third world and beyond to achieve their ends no matter the cost. Yeah, that's about the best part of the book right there. What other book might you compare The Brothers to and why? Oddly, I would actually compare this book 'The Brothers' to another book "Brothers" by David Talbot. The two books are diametrically opposed only in the character of their subjects. The Dulles brothers were the stark opposite of the Kennedy brothers and yet both of their histories intertwine throughout some of the most dangerous moments in recent American history. Where the Dulles brothers created bloodshed and chaos to drive the flames of the Cold war, the Kennedy brothers tried, in their later years, to clean up the mess, thus leading to the inevitable conflict between the clans. I found the subject matter very interesting but the overall narration, while still good, was very monotone in parts and it was easy to lose track, especially if you're listening to it at work. This is an important book for anyone interested in the true history of the United States, and not the flag waving propaganda spouted by ultra right wing and slightly less right wing 'left wing' to have on their shelf. If you want a sequence of books to truly understand the nature of this country as it is today, I would recommend you have Oliver Stone's Untold History of the United States, followed by this book, and to round off the trilogy, JFK and the Unspeakable by Jim Douglass. Read those three books at the least and you'll have a far better understanding of our modern problems and conflicts than you will ever get from corporate media. The performance was just fine. The text was straight-forwardly an effort at agenda propounding. This could only have been worthwhile if the author had been serious about writing real history instead of pushing, weakly and without any objective effort, a conclusion. What was most disappointing about Stephen Kinzer’s story? There can be no question whatever that Kinzer had a theory of history -- or at least of this era of it -- and wrote that theory broadly across his subjects. Every source, from Bob Dallek to H.S. Commager, came from the universally acknowledged reliably and unthoughtfully solidly left-of-center stable of writers about the history of this period. (I will not say "historians," because historians strive at objectivity. He, like those just named, merely pushes his pre-conceived propositions.) He accepts as given, though they be central to his study, deeply contested viewpoints without plumbing the positions in contravention of his presumptions. He over-writes certain factual episodes while glossing over anything (such as the fact, just e.g., that the Rosenbergs were in fact guilty) without even a basic acknowledgement, and never, never allows a round viewpoint to interfere with his -- essentially -- propaganda. This is, as history, terrible. As ego-stroking for the comfortable academic consensus, perhaps it works. The latter is neither my field nor my milieu. This text just isn't history.